Taking Flight: Winter Approaches Are We Prepared? Updates on Coot, Owl and Cardinal. Winter Approaches Are We Prepared? Updates on Coot, Owl and Cardinal. It is true that I am involved in every part of REGI. 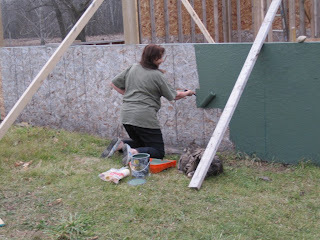 Today I got out the paint and while it was not a perfect job it will serve to cover the exposed boards from winter. Not my best photo to be sure, but around here we do what needs to be done especially when we are rushing to beat the snow and winters wrath. The construction will go on as long as the volunteers can continue. We are prepared for the most part. 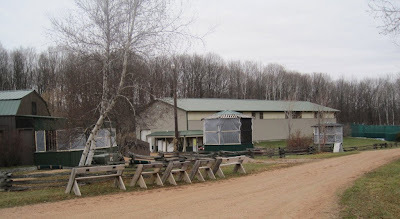 All of the mews ( raptor enclosures are called mews) are covered with a thick layer of plastic to protect the birds from the vicious north wind. Last year we had a documented low of 71 degrees F BELOW ZERO wind chill factor. We are hoping for a warmer winter this year. ::)) We are PRAYING for a warmer winter this year. That might be a more accurate statement. I realize as I look at the photos that they look a bit dark. They were taken about 4 p.m. and there is a light on in the clinic. It sure gets dark here early these days. 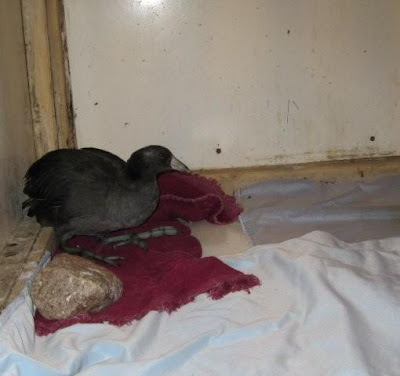 The American Coot that was rescued on a road in Medford is doing really well. It swims daily and has a great appetite. Those are both good things. 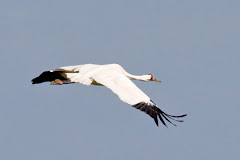 We will make a decision within the next few weeks if we will get him a ride to a southern climate along with a few other birds that need to be in warmer climates by this time. The only other option is to winter him over and release him in the spring. 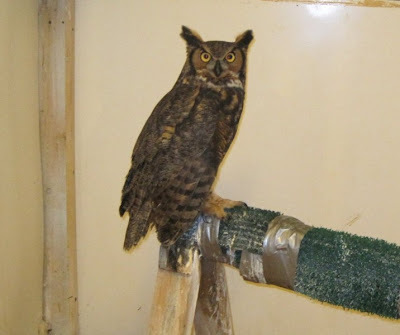 This Great-horned Owl in the photo above is a great story. She was admitted after she was shot. She was not found for several days or more after the incident. By the time she arrived she was suffering from starvation. The starvation was so advanced we were fairly certain she would not be able to survive. The young owl surprised us with her pluck and determination. She is now eating on her own and beginning to fly. She has months of rehabilitation ahead of her before release. She will likely be with us through the winter season. When a bird is starved, the flight muscles are atrophied. They are unable to fly. That is why our exercise flights are so important as they need to build their muscles up to a normal state. Boy am I blushing! I made an error a week or so back. 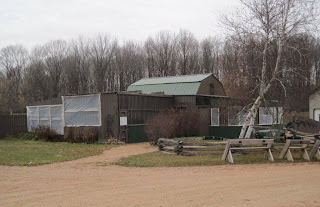 In the blog I identified a young Northern Cardinal as a female and in reality HE is a male. A sharp blog reader caught my mistake. I have no excuse except I often play with the color on photos when they are taken under florescent lights as that one was. Other than that I was just wrong. I am happy to report the both of our cardinals are doing well. The most recent bird from the Merrill area may well be released soon as he has recovered more rapidly than I thought he would.